This book was fantastic. I was literally up all night and didn't go to bed til 9AM because I just couldn't put this book down. P.T. did an amazing job with the characters and the whole story line. It had me hook, line, and sinker. Inara (Nara or Nari) Collins has a rather unusual life which, gets even more stranger the day she prevents a bombing at her school. That one deed starts a chain reaction that even Nara herself couldn't see coming. But in doing so, it also puts her into the path of Ethan, a relatively new kid at her school. Ethan Harris has his own issues and an air of dark mystery surrounding him. Ethan prefers to be alone and to shut out everyone around him.When he bumps into Nara he realizes she may be the one person who can save him from all the bad things he has going on in his life. This month I have read a slew of books which simply took my breath away and Brightest Kind Of Darkness was one of them. Whether I went from wanting to scream at Nara to not go against what must be to complete and utter shock at what has just transpired, this book kept me on my toes and at the edge of my seat. In some ways this book reminded me of the movie Final Destination (which I loved by the way) but with new and exciting twists and turns. I don't want to give too much of the story away for fear of ruining it's otherworldly goodness. On a scale from 1-10 I give Brightest Kind Of Darkness an earth shattering 20. December has been the month for books breaking my scale. This book is just such a phenomenally, fantastic thrill ride. 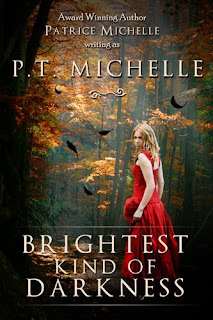 If you love people with supernatural gifts, two somewhat tortured souls finding each other, teenage angst, or a good ole' paranormal book than Brightest Kind Of Darkness is a book you need to pick up. The only thing negative I would say is that the book ended too sudden for me. When I started reading this book I had no idea it was book 1 of a series so I was total expecting a resolution BUT with that being said I SO CAN NOT WAIT to read book 2 in this series. EVERYONE needs to run out and pick up this book. I've seen this around and have bookmarked it on Amazon, but your review makes me want to buy it NOW! :-) I've been in the mood for a book that's different than most other paranormal stories out there and this one sounds like it's the one. Thanks for the review! Thank you so much for the amazing review, Raquel! It really was just a great read DJ. Make sure you have time to read it from beginning to end because you are so not going to want to put the book down. P.T. thank you so much for giving me the opportunity to read Brightest Kind Of Darkness. It was/is one of my top 10 favorites of 2010. I've recently added this one to my wishlist, sounds great and hope to read it soon. Thanks for the review! Great Review I was super surprise reading this book it is really awesome I love it! and I can't wait to read the next book!